Easter week is a celebration of hope for everyone. If you are looking for a place to explore faith, connect to good people, or bring a little joy to your life, this is the place and the time to check out The Crossing. Going to an Easter service at The Crossing will give you a jumpstart into joy! It's an hour that will inspire & revive you and the people you love. Get ready for a SUPER EGG HUNT! 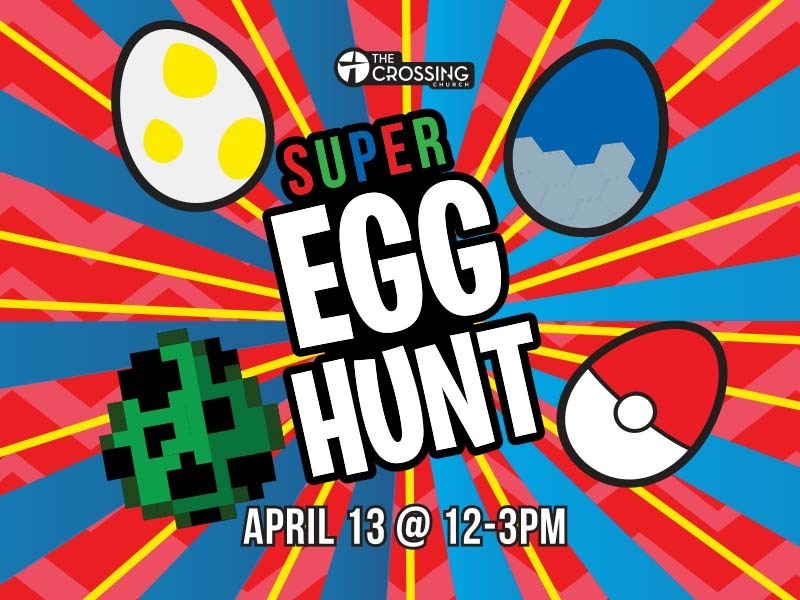 It's going to be a decked-out egg hunt experience like you've never had before, featuring four themed Egg Hunt rooms: Pokemon, Super Mario Bros, Minecraft, and Fortnite! This event is FREE, so bring all your friends. Plus, you can make a difference in other kids’ lives by bringing non-perishable food items for StandUP for Kids, a local non-profit that serves homeless youth. Here's a list of the items that are most helpful: tuna, fruit, canned pasta, soups, Vienna sausages, corn, baked beans, chili, Sloppy Joe, lemonade, iced tea, nuts, pasta sauce, dry pasta, rice, mac-n-cheese, seasoning, salt and pepper, peanut butter, cereal. Please visit the Registration table this Saturday to sign up. We hope that you will choose to join us this easter! StandUp For Kids is committed to providing healthy food to those we serve throughout the year. Food from The Crossing’s food drive will be used to provide groceries to young adults ages 18-24 who are moving from the streets, from living in their car, or being doubled up into a room rental or an apartment for the first time. Many of these young people are college students and are both housing and food insecure, meaning they’re sleeping in cars and don’t have the proper food to eat.